Remon Tijssen, principal designer at Adobe’s Experience Design (XD) group, and Cathi Kwon, principal product manager at Adobe, visited RIT May 20 to test out the New Media Team Projects. For the cross-disciplinary senior projects, students created interactive user experiences for handheld mobile devices and big screens. Leaders from software company Adobe were impressed with the new media senior projects of Rochester Institute of Technology design and development students. “We are very impressed with the ideas that the teams have come up with and it has been amazing to see them in person,” said Remon Tijssen, principal designer at Adobe’s Experience Design (XD) group, who visited the RIT campus May 20 to see the projects in-action. Each year, senior students from the computing-focused new media interactive development major and the aesthetic-centered new media design major come together to create a digital product as part of their capstone project. Adobe, sponsors of this year’s New Media Team Project, challenged the seven cross-disciplinary teams to create new user experiences that take advantage of the interaction between handheld mobile devices and big screens. Each team was provided a large touchscreen TV and supplies for the project. In addition, Tijssen and Cathi Kwon, principal product manager at Adobe, met virtually with the teams to provide direction for their creations. “In our talks, we challenged the student’s conceptual ideas about their projects and encouraged them to think about ways to increase interaction,” said Tijssen. 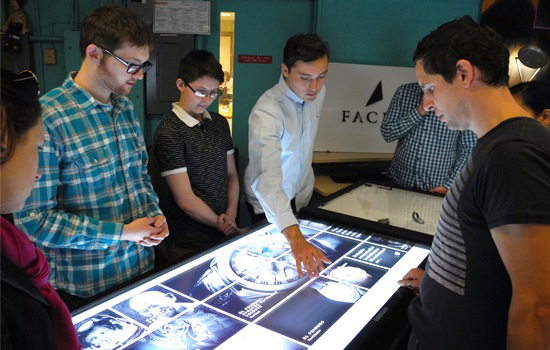 Facet—An interactive touch-screen storefront experience where users can explore high-end retail in a completely new way. Synapp—A collaborative notebook for the digital classroom that helps students and teachers. Bitness—An immersive group exercise experience that will drive more people to use the gym through the Kinect game Space Race. It will also promote a healthy, positive and energetic workforce, while building team morale within a company. Interlude—A mobile musical game that takes advantage of idle crowds at festivals and events to raise awareness for music education. Espy—A dynamic and interactive way-finding experience for conferences or festivals. The group used Imagine RIT as its first case study. Vesti— A touch screen display for dressing rooms paired with a mobile application that creates an advanced, personalized shopping experience. The experience helps bridge the gap between online and in-store shopping. Mendo— An interactive multi-screen exhibit that simulates what the team imagines to be the future of the digital healthcare industry. For more than 15 years, the new media design program in RIT’s College of Imaging Arts and Sciences and the new media interactive development program in RIT’s B. Thomas Golisano College of Computing and Information Sciences have been collaborating through courses and projects. The cross-disciplinary work aims to give both visual design and computer programming students the tools needed to create the next generation of Web, desktop and mobile applications for the interactive design and development fields. The New Media Team Project course, taught by Doubleday and Adam Smith, associate professor and program chair in the new media design program, seeks to combine design and development workflows with cross-discipline team building and project management. As part of the class, teams exhibited their interactive projects at the Imagine RIT: Innovation and Creativity Festival. When Michael Gough, former vice president of experience design and creativity at Adobe, attended Imagine RIT in 2014, he was impressed by the new media student projects. Through RIT’s Center for Media, Arts, Games, Interaction and Creativity (MAGIC) and Adobe’s XD group, Gough volunteered to sponsor the 2015 new media projects. The new media project theme began from Adobe’s Project Context—an initiative aimed at using multiple-connected screens to make in-person collaboration more effective.